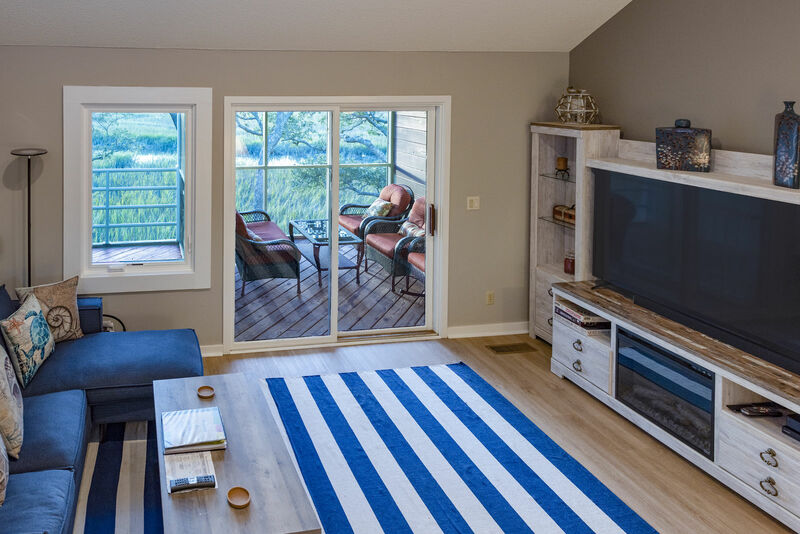 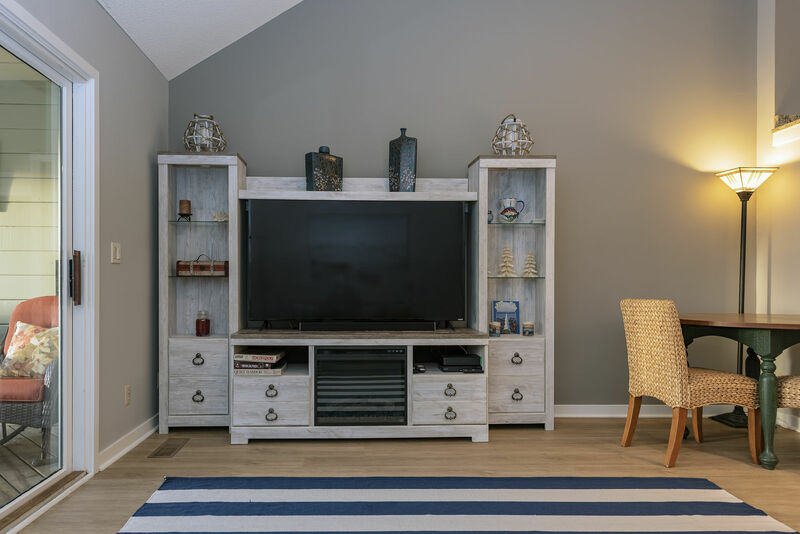 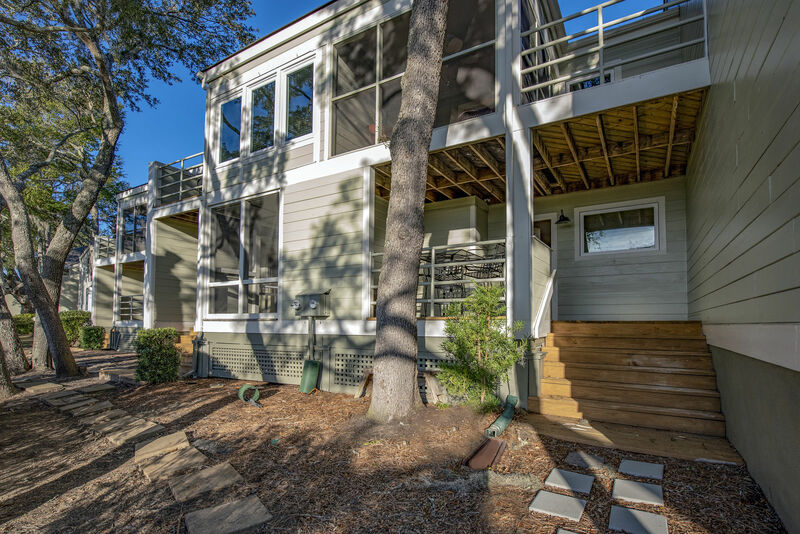 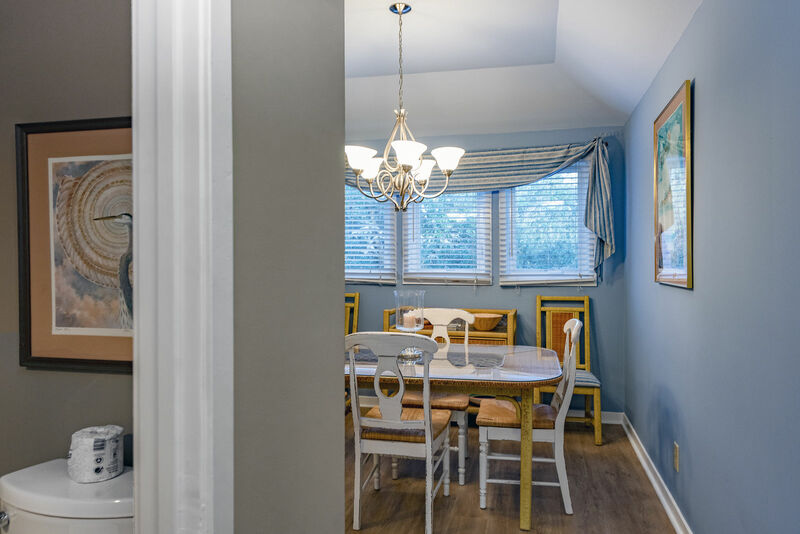 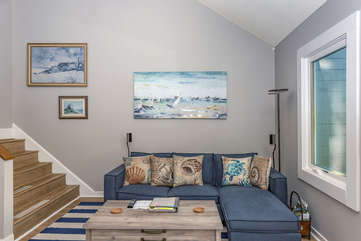 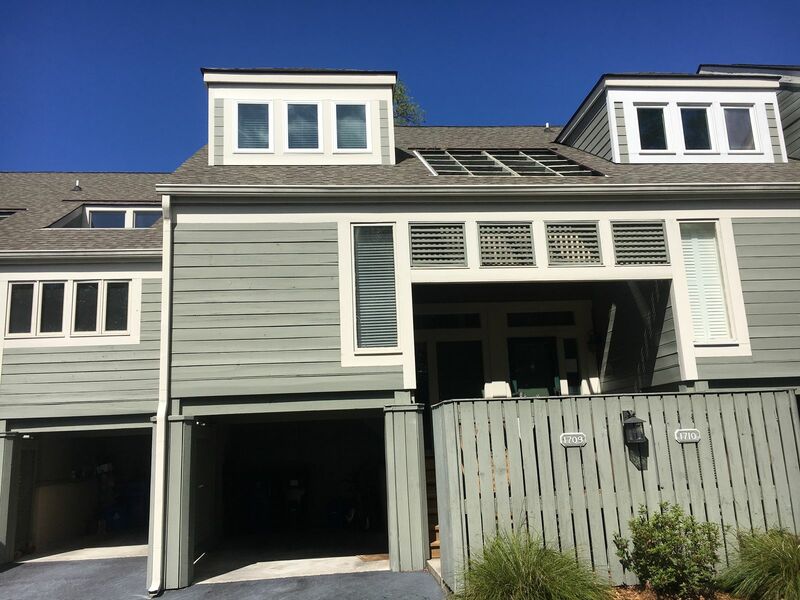 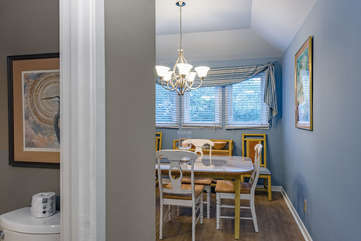 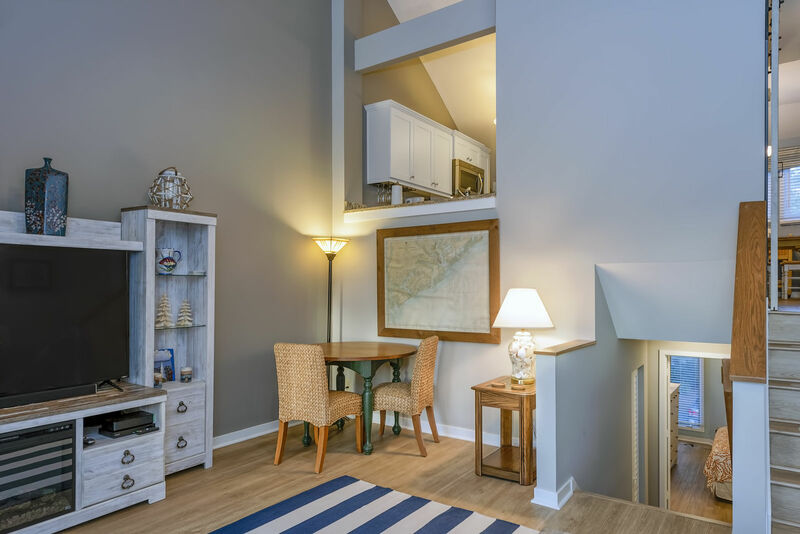 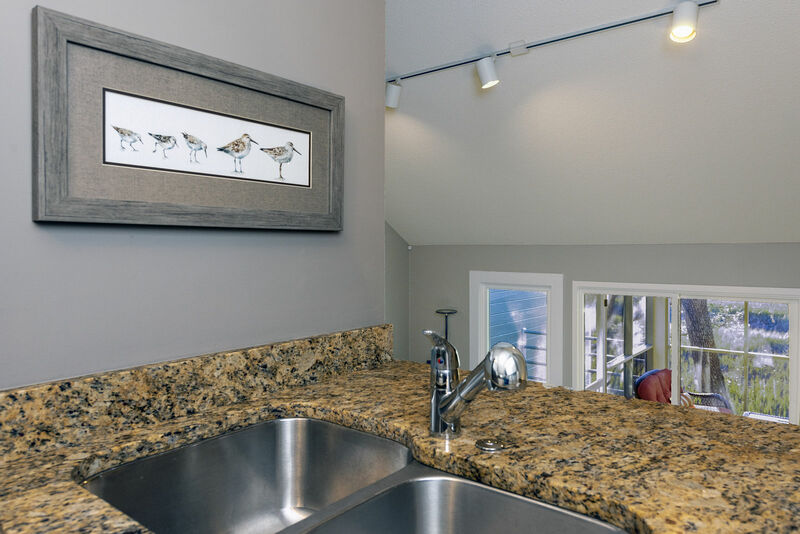 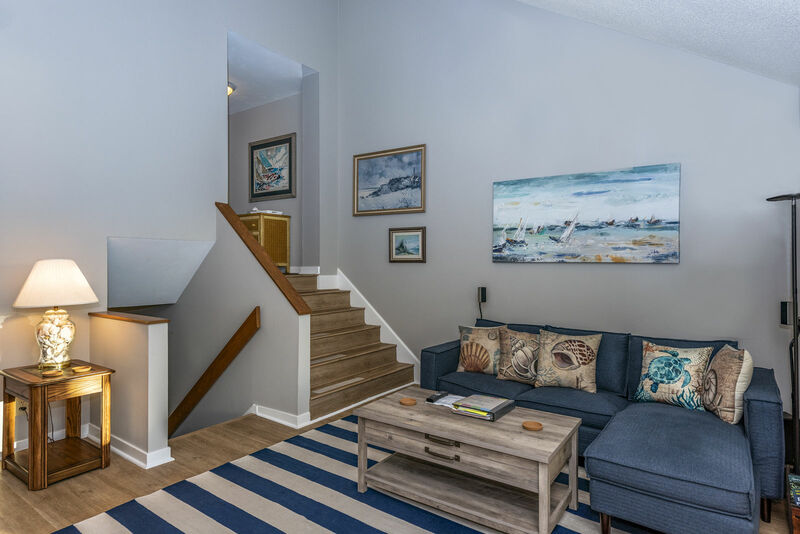 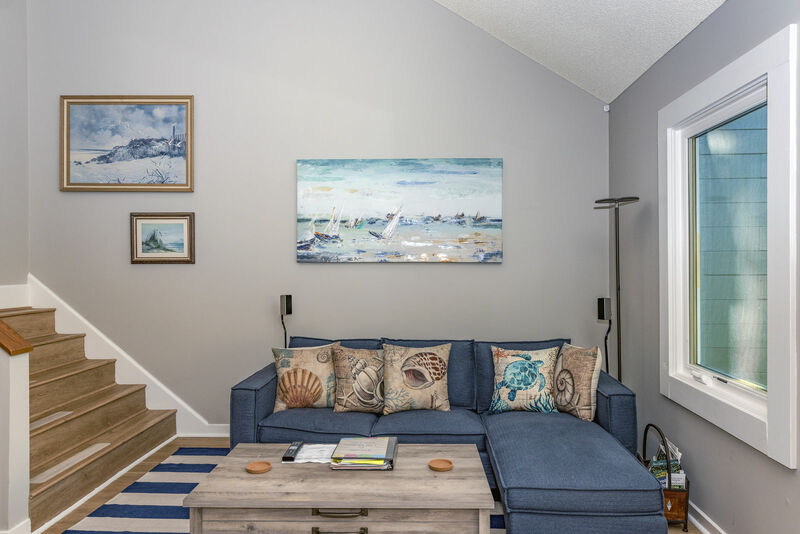 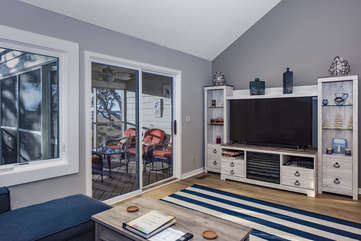 This multi-level townhome has a pretty blue and white coastal decor and amazing views of the tidal marsh surrounding Bohicket River. 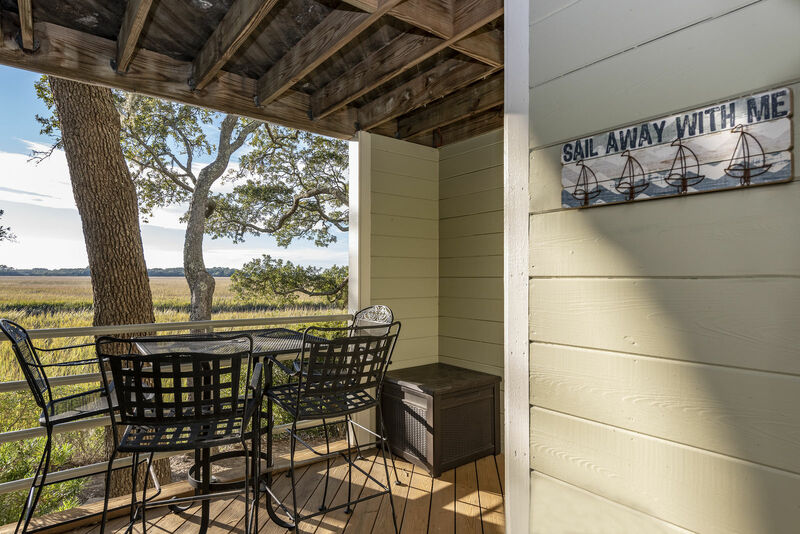 With views to the Rockville shrimp boats and spectacular waterfront sunsets, this home provides the perfect setting for you to relax during your Seabrook holiday. 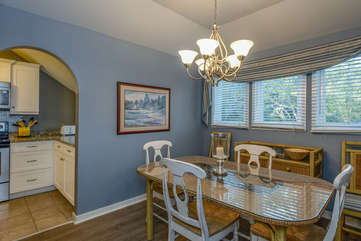 This villa is also in a great location on Seabrook. Just a short walk takes you to the spectacular Lake House facilities where you have free access to the large outdoor pool. 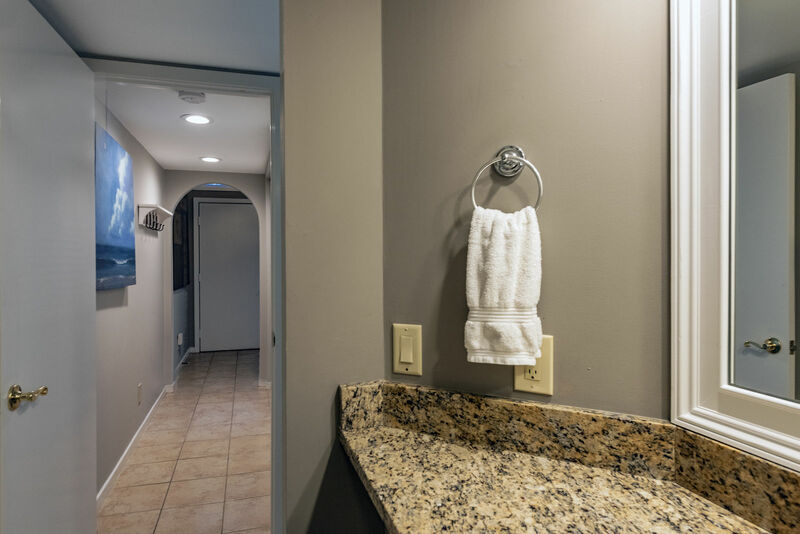 Grab your tennis racquet and hit the ball on one of the 15 Har-Tru courts across the street. You can even hear the horses braying at the nearby Equestrian Center. 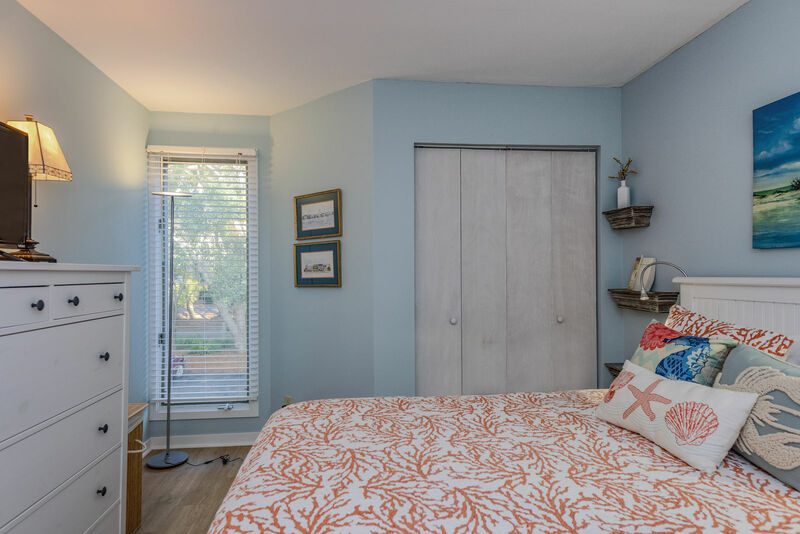 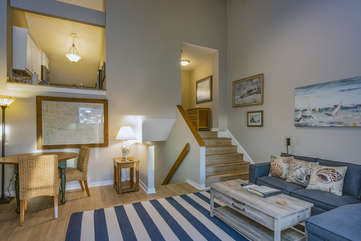 Shelter Cove townhomes are in a perfect location! 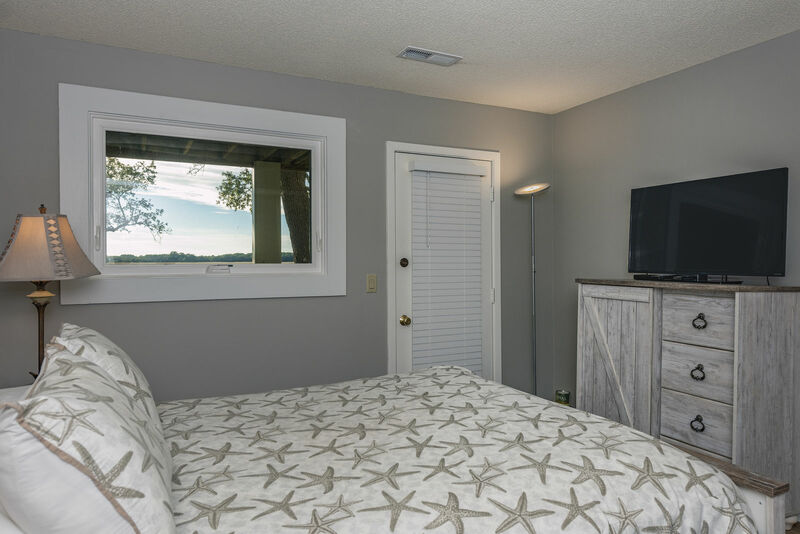 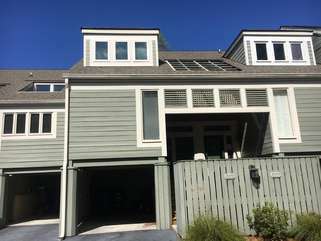 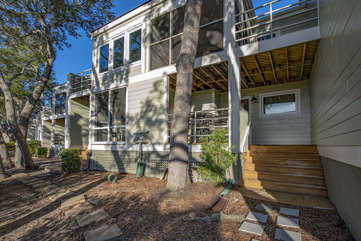 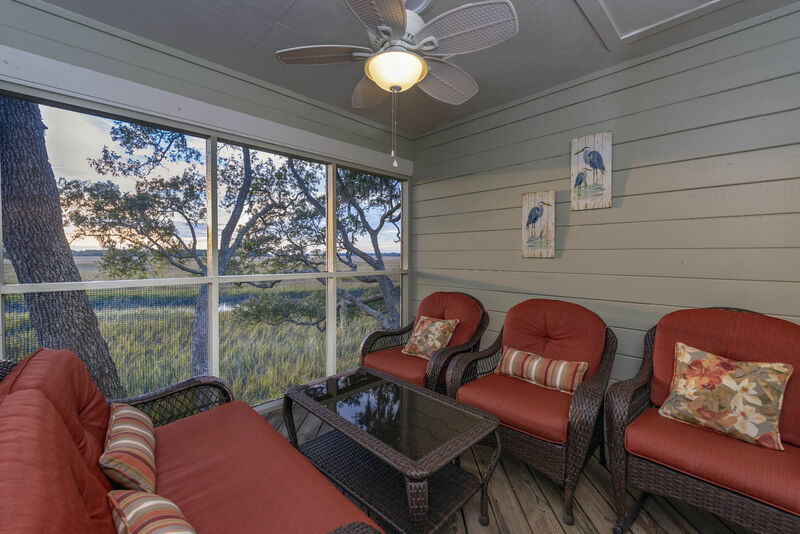 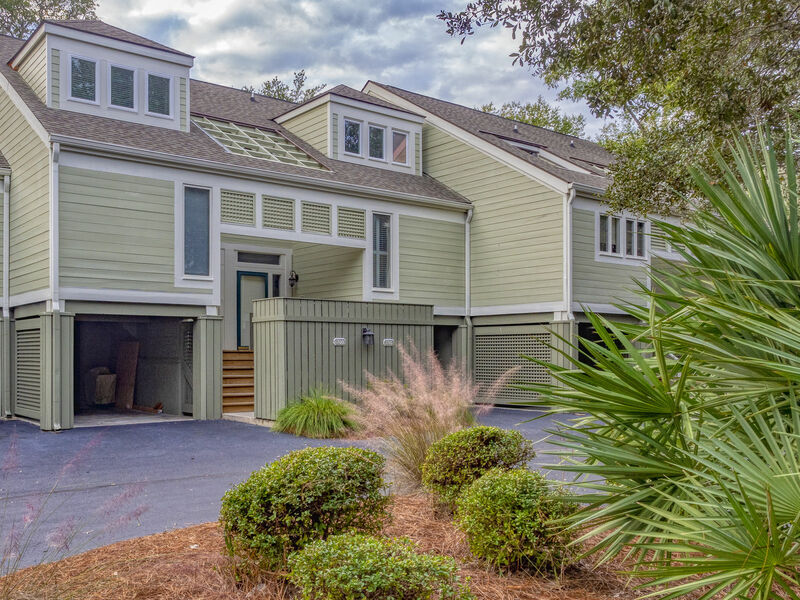 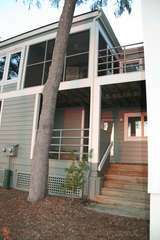 1709 Shelter Cove is perfect for a family traveling to Seabrook for a relaxing vacation. 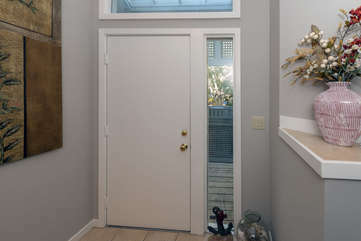 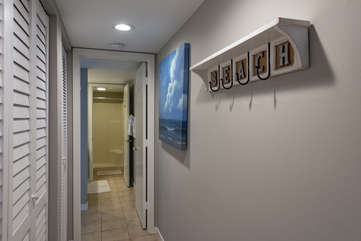 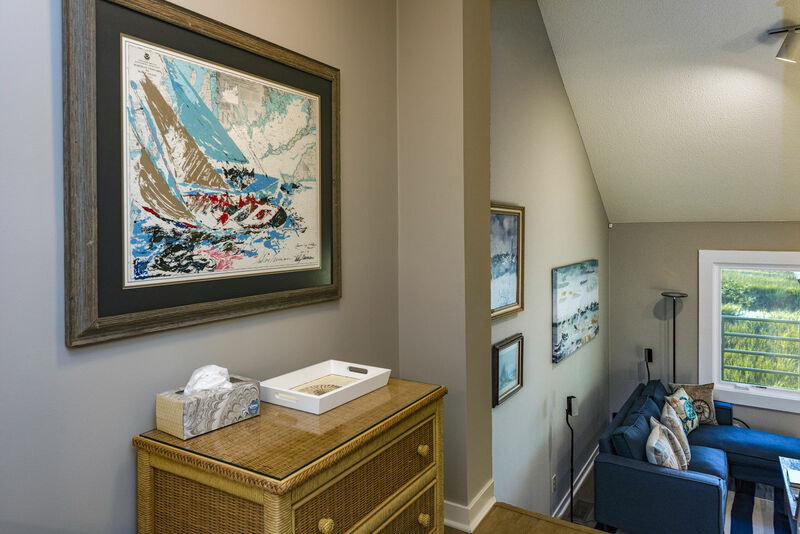 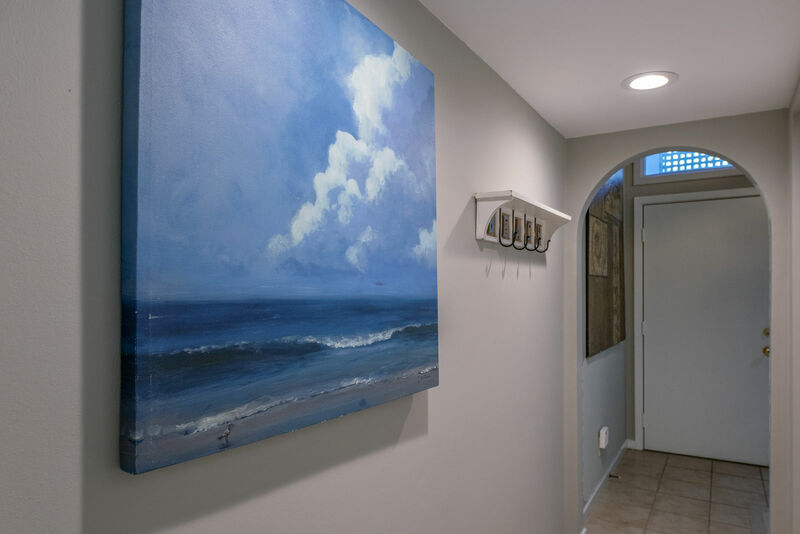 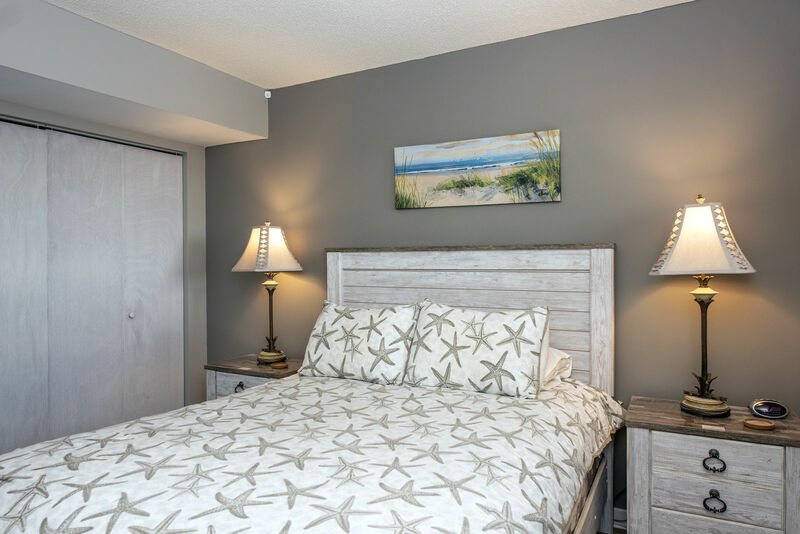 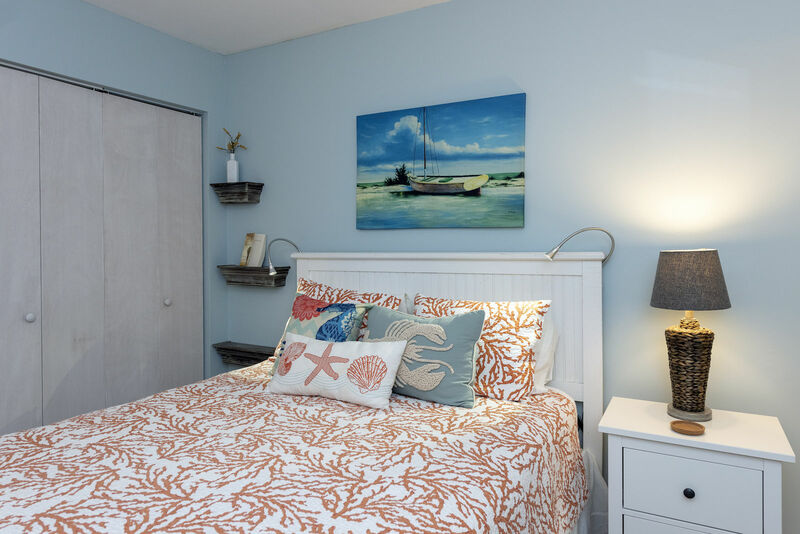 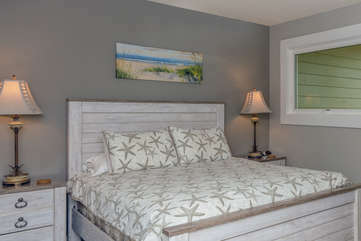 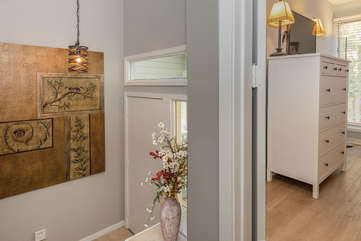 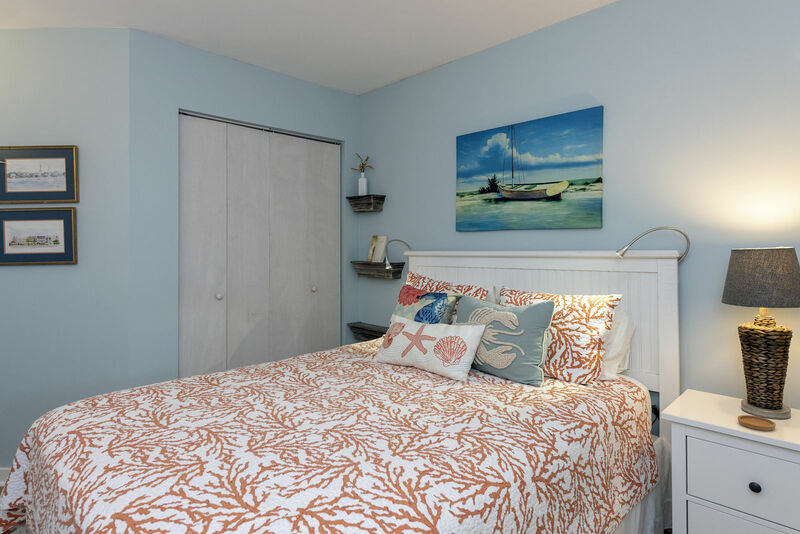 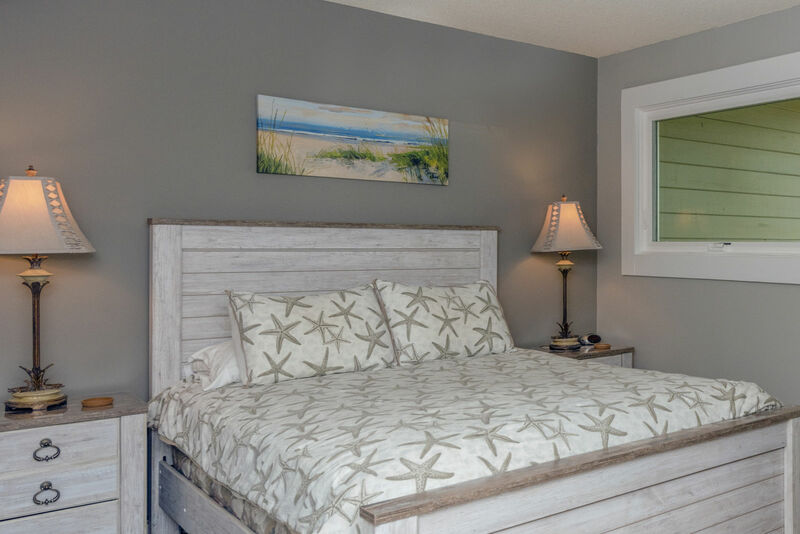 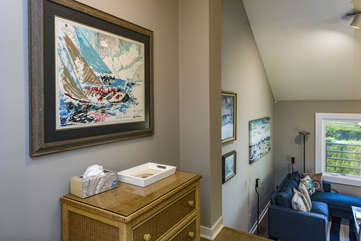 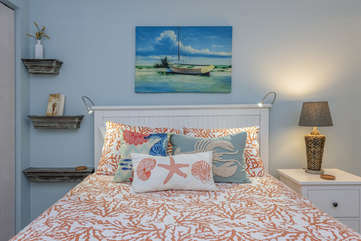 Enter into the foyer and down the hall is the private master bedroom suite that has a coastal decor. 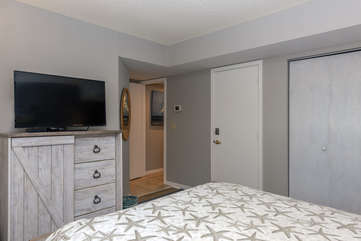 There is a queen sized bed, a TV for viewing your favorite morning show, and an en suite bathroom. 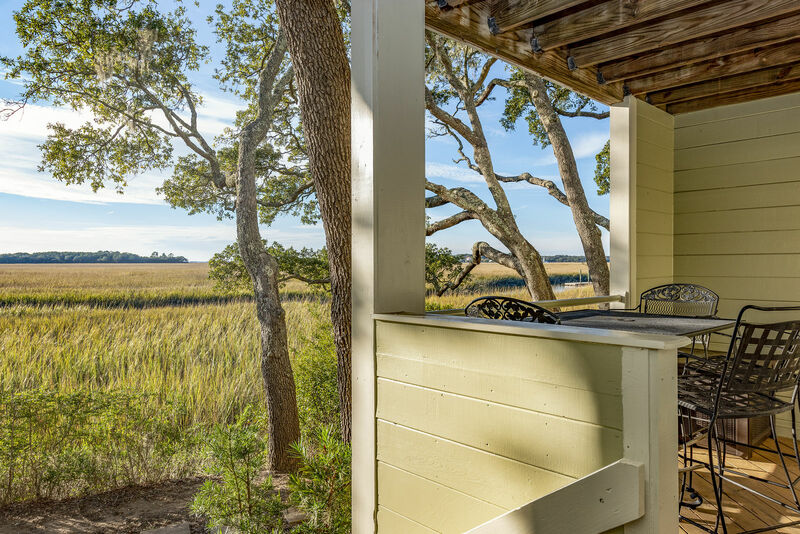 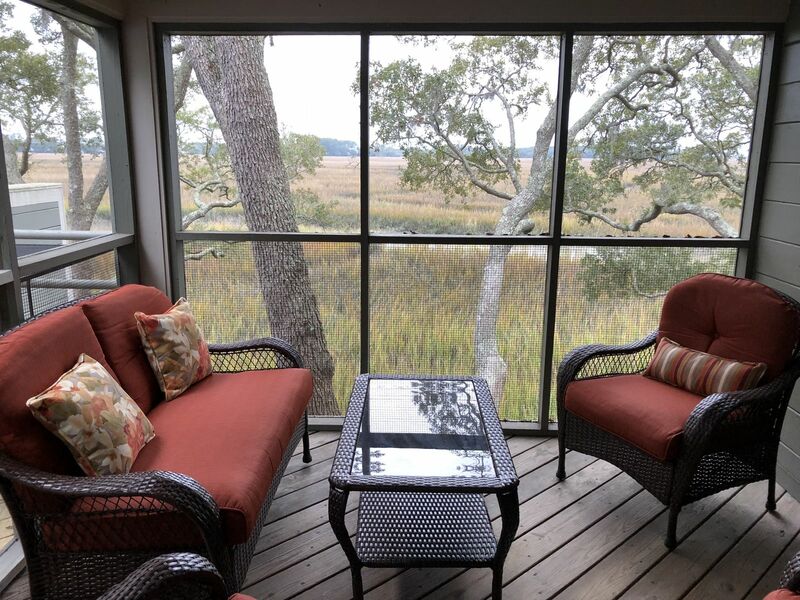 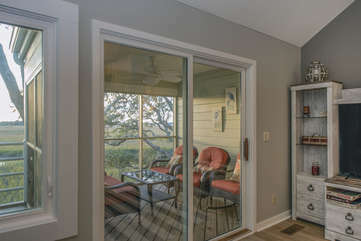 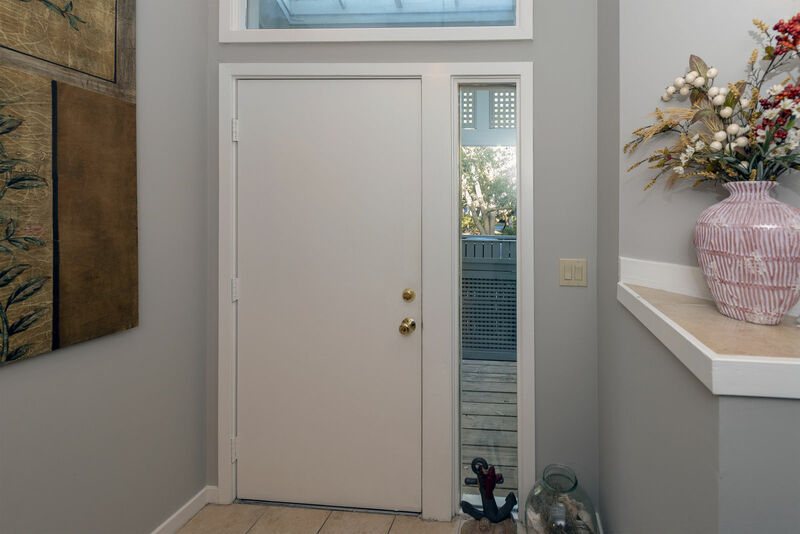 Sliding doors in the bedroom lead to the open deck that has a beautiful marsh view. 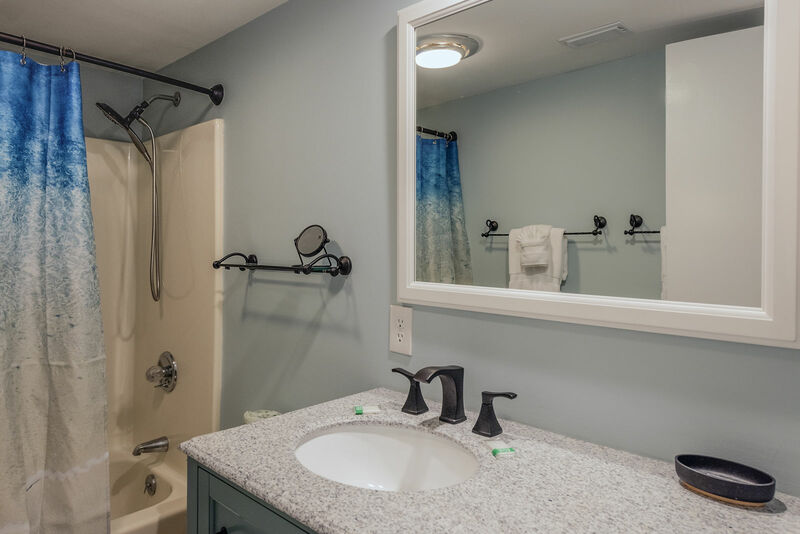 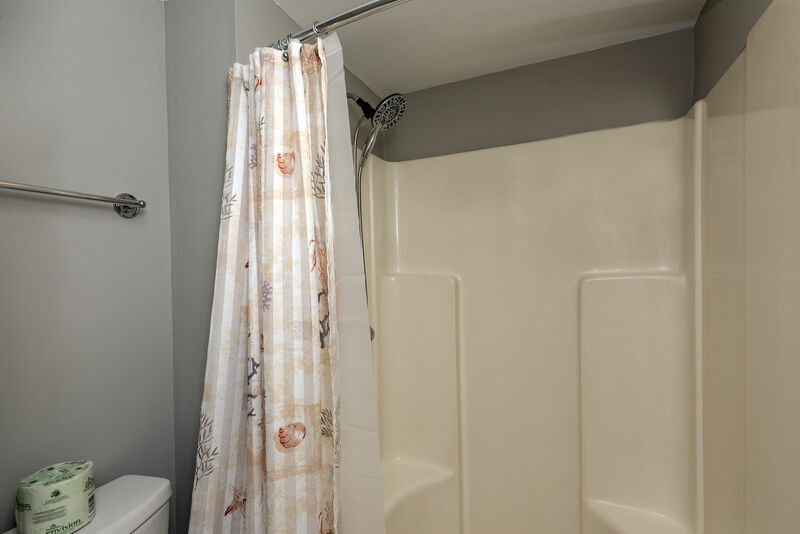 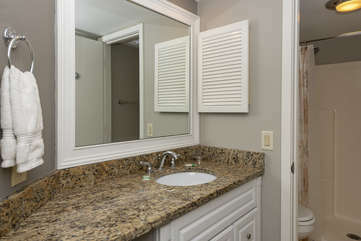 The master bath has a shower and separate large vanity area. 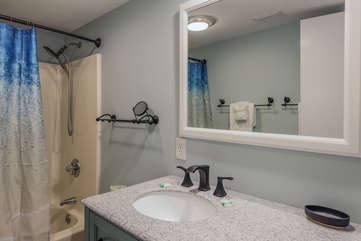 On this level there is also a full sized washer and dryer for your use. Take a few steps up to the next level where you will find the second bedroom. 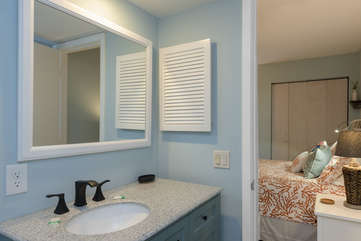 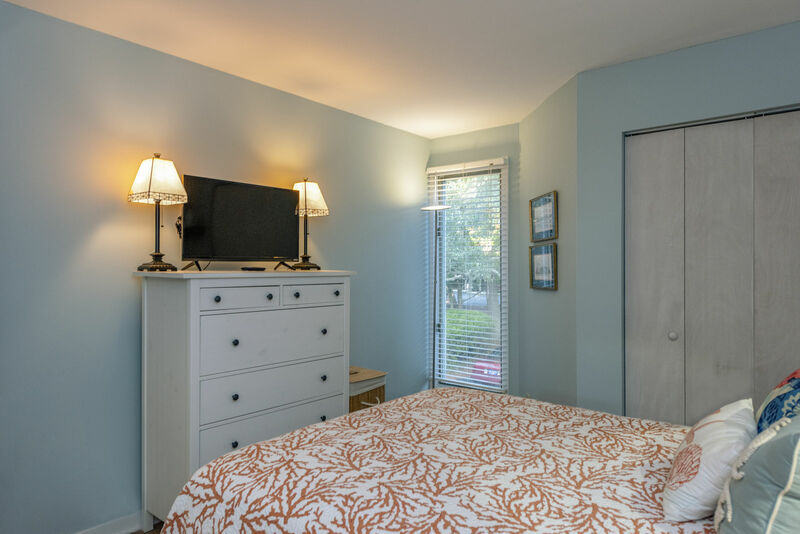 This is a cheery room with a queen size bed, a chest for your necessities and an en suite bath. 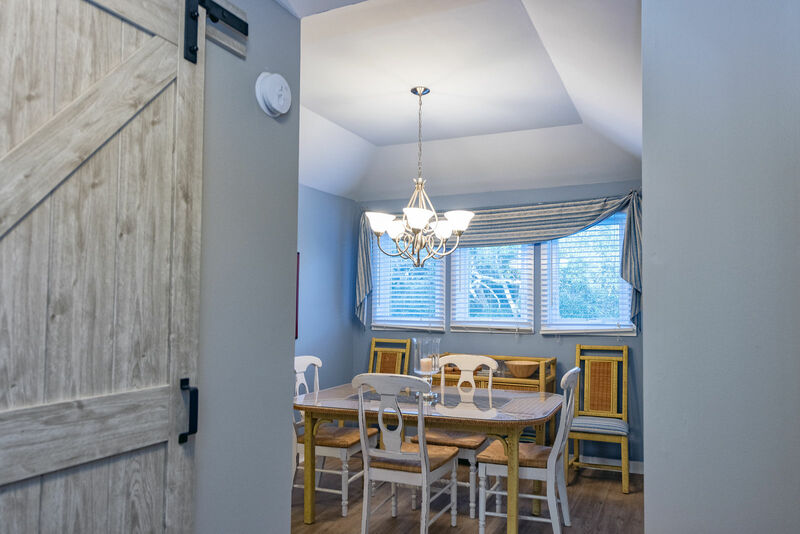 Please note: Maximum occupancy for this villa is 4, including children. The living room is on the next level and has amazing views of the marsh landscape and river beyond. 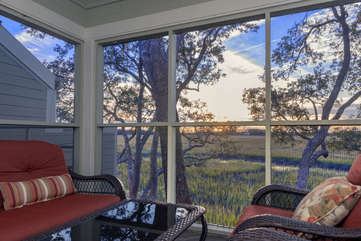 Relax on the new sectional sofa while watching TV or gazing out at the marsh. There is a new entertainment center with a new large HGTV. 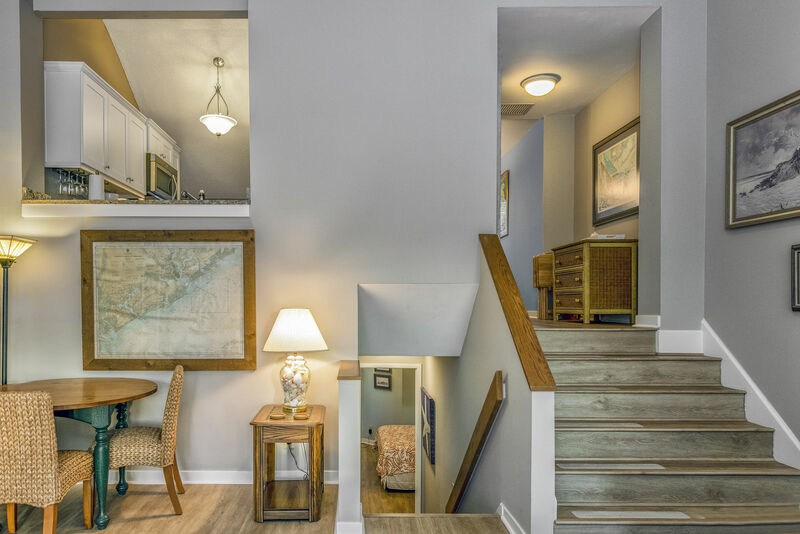 Up a short stairway takes you to the next level. 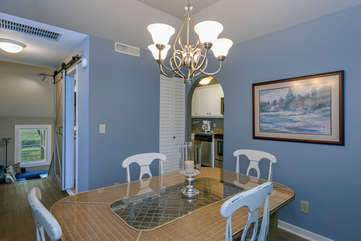 The dining room is spacious and has a table that seats 6. 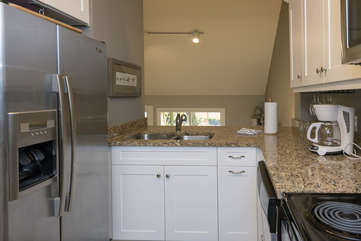 The new kitchen is just beyond. 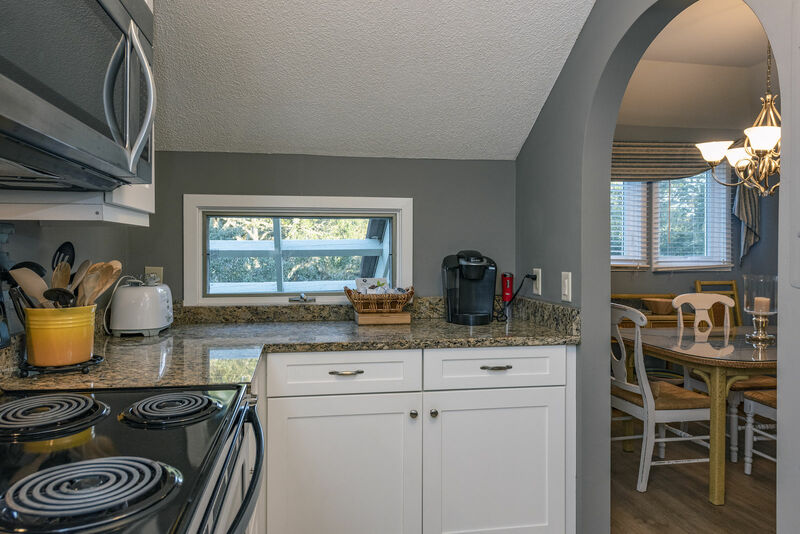 Granite countertops, lovely cabinetry and an opening, overlooking both the living room and the great view beyond, allows the chef to be included in all the family activities. 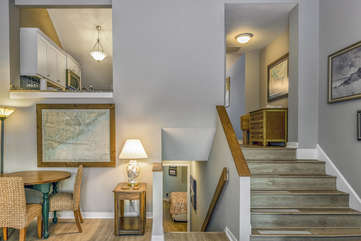 There is a half bathroom on this level. The Shelter Cove Villas have a neighborhood pool for guests to enjoy. Amenity cards giving you access to the facilities of the Seabrook Island Club, are included in the rent. These cards give you access to the oceanfront pools, Pelican’s Nest outdoor restaurant/bar, Island House restaurant/bar, golf and tennis. 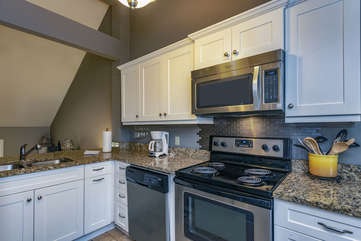 Additional fees are charged for all activities except pool usage. 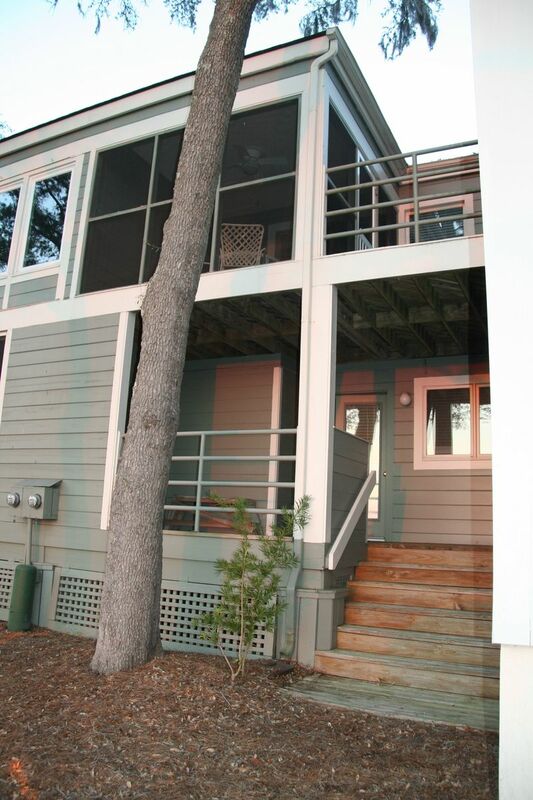 The Lake House facility – fitness center, indoor/outdoor pool - is located near the gate house. 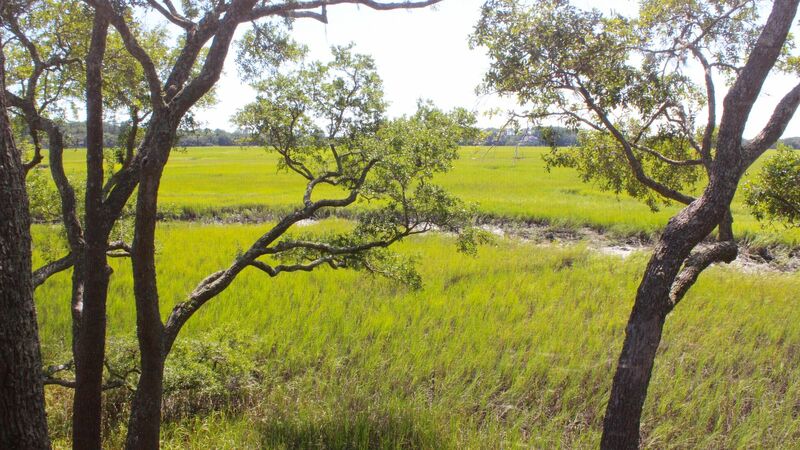 Passes for it may be purchased for $15/day/person or $10/day/person for a 3 day pass. 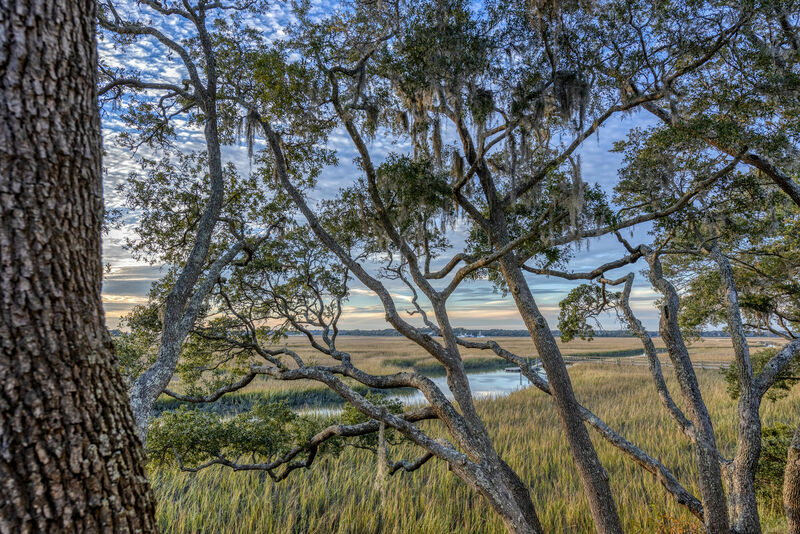 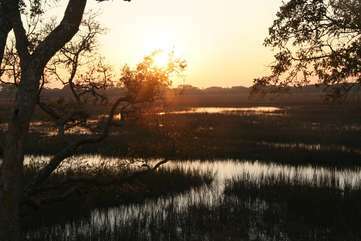 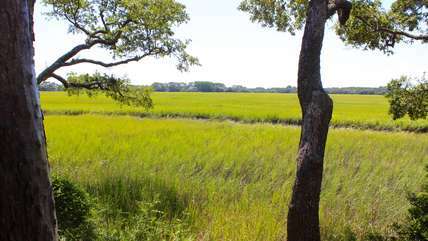 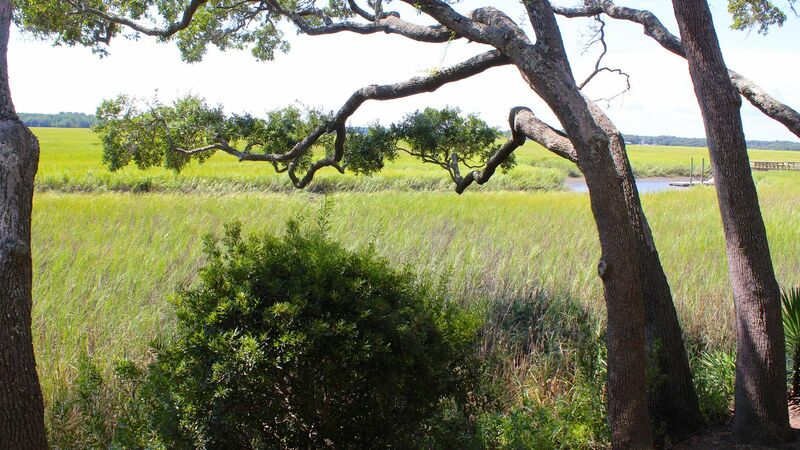 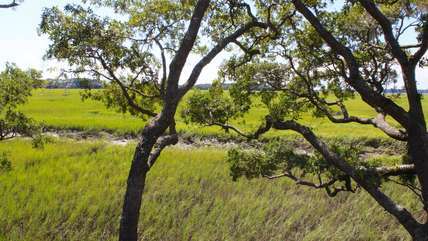 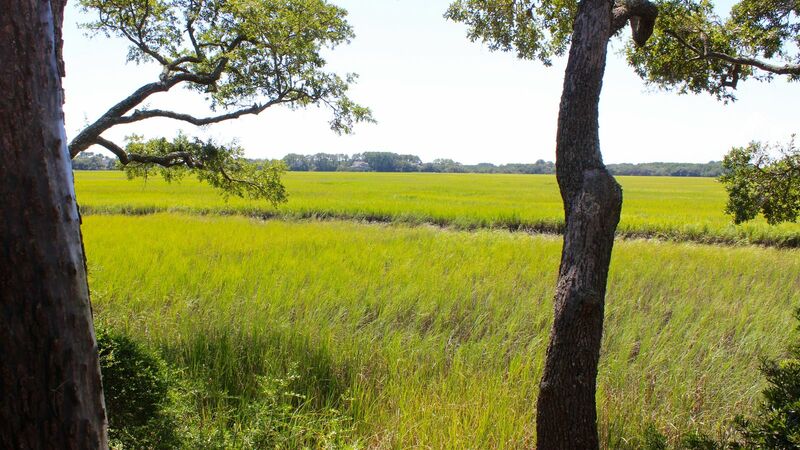 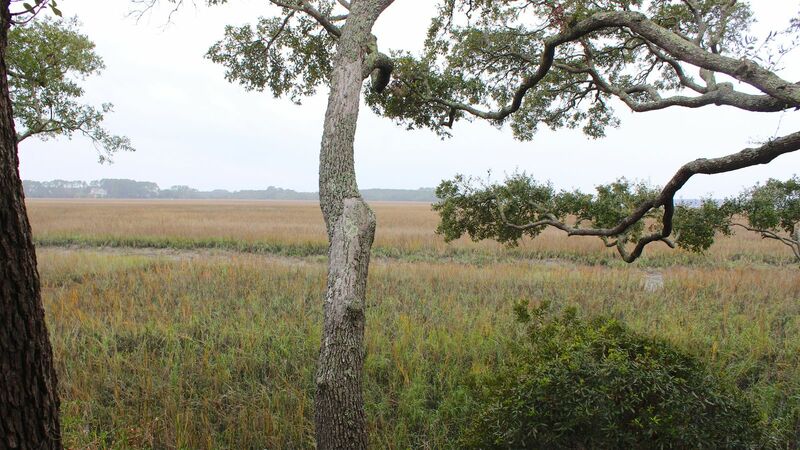 Seabrook Island is located just 23 miles away from historic downtown Charleston. Visit Market Street with the various vendors, take a carriage ride thru time. 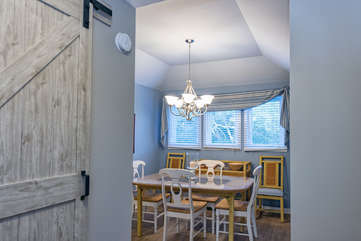 Sample one of the many fabulous restaurants and southern hospitality. 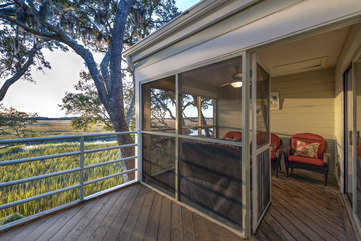 1709 Shelter Cove has everything you will need to have one of the best family vacations ever!